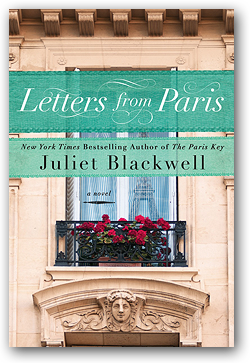 A review of Letters from Paris by Juliet Blackwell. Post may contain affiliate links. I am an admitted Francophile and will read any book that has the words Paris, France, or French in the title. Now, I’m not saying that I enjoyed all of those books, I’ve read some that were terrible and some that were great and a lot in between. I am happy to say that Letters From Paris falls in the very good range. The story opens with a prologue set in 1898. It introduces us to Sabine. Sabine is sneaking out in the middle of the night. Running away from a man who has obviously been cruel to her. She runs into the darkness, but she hears footsteps. She makes it as far as the Seine. Fast forward to the current time and we meet Claire. Claire is back home in Louisiana because her beloved Mawmaw is very ill. While there, she remembers back to an old plaster that she found in a trunk. A beautiful woman that didn’t survive the trip from Paris without getting broken. But even more mysterious is the note that is included. Her Mawmaw encourages her to go to Paris, telling her that perhaps she’ll discover a secret. Claire leaves her job and boyfriend in Chicago and heads to Paris. She tracks down the mask-making atelier and since they are in need of an English speaking translator manages to stay there in exchange for working for them. The story is part mystery and part love story. It aptly weaves the events in the 1890’s with the current events today. The plot took several turns, which I didn’t see coming at all, so that added to the thrill. The bits of French culture that were thrown in were just the icing on the cake.